Good news for 83% of the UK’s population – the UK has not been concreted over! The news that the percentage of the UK land area that is densely built upon is 0.1% has won the title of UK Statistic of the Year, under a new initiative from the Royal Statistical Society – from nominations made by members of the public and the organisation’s members. 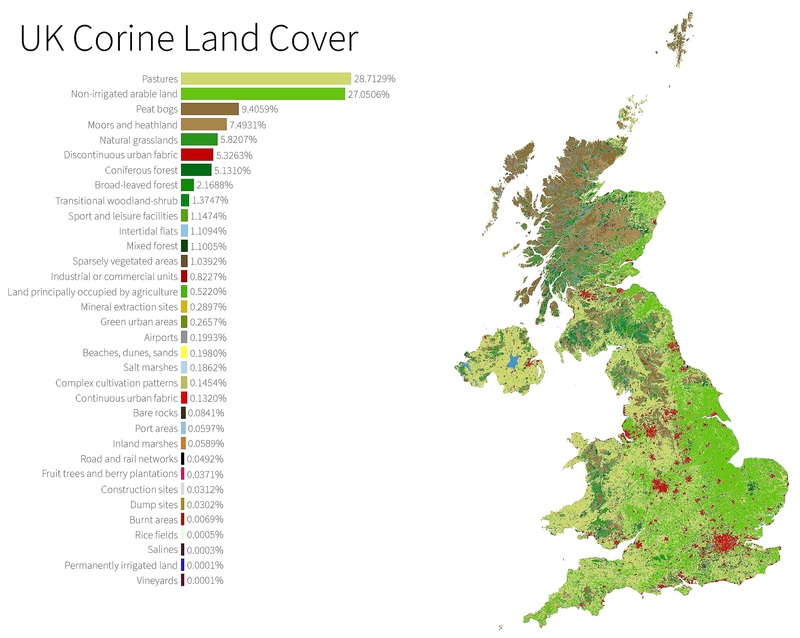 The statistic comes from a report by Professor Alasdair Rae, of the University of Sheffield A Land Cover Atlas of the United Kingdom which was published in November 2017 using Corine Land Cover data from 2012. The 0.1% of land areas considered to be CUF (made up of ‘continuous urban fabric’) are those that are most densely populated – where at least 80% of ground is impermeable and comprises buildings, roads and other artificial surfaces. The alternative DUF (‘discontinuous urban fabric’) accounts for just over 5.3%, and in fact only 5.4% of UK land is considered ‘urban’ at all. Pasture land (28.7%) and non-irrigated arable land (27%) accounts for most of the UK’s landscape, while peat bogs (9.4%), moors and heathland (7.5%), natural grassland (5.8%), coniferous forest (5.1%) and broadleaf forest (2.1%) make up between them nearly a third of the landmass. The report reveals the UK local authority areas with the highest percentage of each land cover class. In London, the City of London has the highest percentage of CUF (97.6%) and Lewisham the highest percentage of DUF (87%). Westminster has most land classified as ‘green urban’ (21.1%) largely because of its royal parks. Richmond upon Thames is classified as nearly 41% ‘sport and leisure’ (golf clubs). Hammersmith and Fulham is 6.3% road and rail networks. The statistic might come as something of a surprise to those of us among 83% of the UK population who live in urban areas. In fact, a recent Ipsos MORI online survey of the British public revealed that the percentage of UK land that was densely built on was thought to be on average 47%!